Andrew WK: he is an actual human, named Andrew Wilkes-Krier. 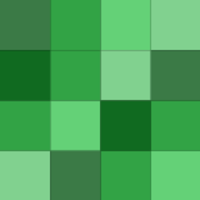 But he is also a piece of performance art whose persona was in part designed by others. This seems to confuse a lot of people! Including Andrew, sorta? So now, Andrew WK, who wants nothing more than to party, and for you to party with him, is suddenly issuing bizarre statements about how he is not a hoax. Here is the story, which has been around in various forms since I Get Wet came out in 2001: shadowy figures (we always heard that I Get Wet/Andrew's whole thing was orchestrated by Dave Grohl, but his name has been absent from the more recent conspiracies!) "invented" Andrew W.K., or Andrew W.K. never existed at all, or he used to exist but was at some point (2005) replaced with an actor. Here is the whole conspiracy. Andrew W.K. is, or was, someone named "Steev Mike," who is or isn't the real Andrew W.K., and who was listed as "Executive Producer" on I Get Wet. Andrew either used to go by the name Steev Mike and no longer does or he never did and Steev Mike is someone else (Grohl?). 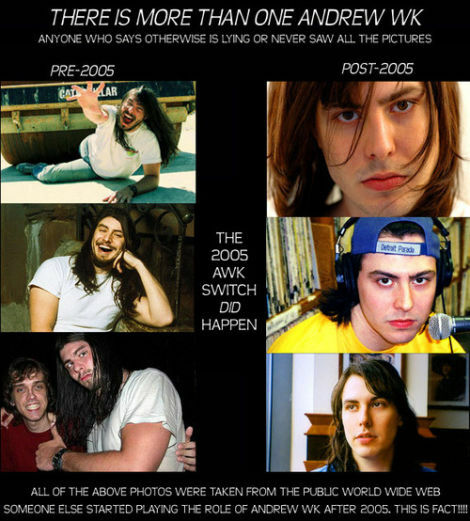 And then there was a great big switcharoo, and now post-2005 Andrew W.K. is a different dude. As far as we can tell, the deal is, this goofball metal kid made a bunch of awesome party music, and got attention for his awesome party music, and then the "Andrew WK Persona" thing was put together by a bunch of people including probably Grohl and Andrew's estranged former manager, and then he recorded his followup album by himself, so it sounded different, and then at some point in 2005 he shaved and lost weight and apparently that baffled enough people that it became a vast conspiracy theory. And because he is a complete goofball who says lovably bizarre things his statements on the matter tend to just confuse people all the more, like when he is all "I am not the same person as I was" and people are like he is not the same person! But the best part of this is that Andrew is going to host a Q&A party to clear it up! "Due to an overwhelming amount of questions regarding his career, his past, and his future, Santos Party House co-owner, Andrew W.K., has decided to offer himself to the people of New York City, for an evening of totally open inquiry. This is a chance to ask Andrew anything, and he'll certainly do his best to answer everything. Have your questions in mind and come on down! This is a one-night-only event sure to get the PARTY going HARD!"